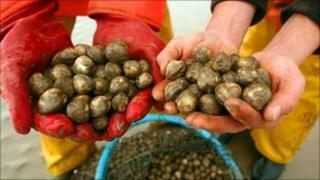 Scientists at Queen's University have developed a new technology that will make shellfish safer to eat. The breakthough by the Institute for Agri-Food and Land Use ensures shellfish, like cockles and oysters, are free of toxins before they reach the public. The current process for monitoring potentially dangerous toxins can take up to two days. But the new test slashes that time to just 30 minutes. It detects paralytic shellfish poisons by using a biosensor technology. The toxins paralyse anyone who consumes them and kill around 25% people who are poisoned. Professor Chris Elliott, who led the project, said: "While the existence of these toxins has been known for some time, there have been major concerns about the effectiveness of tests used to detect them. "There is also growing evidence that climate change is causing many more toxic episodes across the world, resulting in the closure of affected shellfish beds. "The new test, developed at Queen's, is much quicker and more reliable than existing methods. "It works by using unique 'detector proteins' to seek out minute amounts of toxins present in mussels, oysters, cockles and scallops." The test was developed as part of a 10m euros BioCop research project led by Queen's and involving 32 international research partners and the European Commission. The researchers at Queen's have signed a contratc with UK-based company Neogen Europe to commericalise the idea.